Society changes. We believe the Church needs to change with it. Not in its doctrine or core values, but in how it functions in order to keep reaching the ever-changing target. Have you ever had your team decide on doing a special event or launch a new initiative only to find out you didn’t have the technology to do it correctly (or at all)? One of the significant changes we’ve seen recently is the need to employ Technical Directors at the executive level. It’s certainly not new for churches to employ part-time or even full-time technical staff. Most medium and large churches have one or more employees that help with sound or video or lights on Sunday mornings. Many just pay a small stipend for the few hours they work on the weekend, while others may have someone who oversees all these functions during a 40-hour week. In a vast majority of cases, this person reports to the Worship Pastor. But what we’ve been seeing is the addition of a Technical Director at the highest level of staff leadership. Whether it’s called an Executive Staff or Leadership Team (or something else), this person reports directly to the Lead Pastor. As technology has embedded itself in our society and churches, we have become incredibly dependent on it. Consider this: In nearly every church, we use audio technology, video projectors, LED or moving lights, computers with presentation software, iPhone apps, and many other types of digital devices. Many churches have added multi-site, video venues, online campus, or all three! All of these require the same thing: quality technology and implementation. Let’s face it, if you can’t hear the pastor well, let’s all just go home! This last Sunday, I looked back to the control booth in my church and counted 9 volunteers and staff working. In addition, this particular church employs over 50 people. Each one has a computer, a smart phone, and some sort of specialized software to help make them efficient and to communicate with their respective volunteers and members. They are highly dependent upon technology to work for them. In the last two churches I worked for, we lost power during the day a few times. After a couple fun minutes of joking with staff in the dark, I realized work could not continue without functioning technology. We couldn’t even use the phones since they were digital. Realizing we were pretty much useless without computers, I sent everyone home. 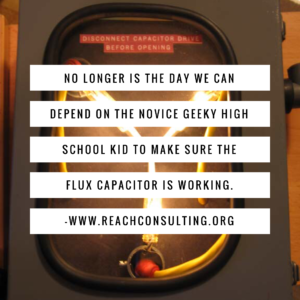 With the increase of highly sophisticated technology used on Sunday mornings, no longer is the day we can depend on the novice geeky high school kid to make sure the flux capacitor is working. 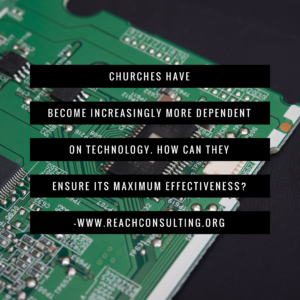 As a result, we’ve seen more and more churches reduce the communication gap between senior leadership and technology specialists. Technology is no longer an afterthought. It’s a major and important part of the church budget. At least it should be. Along with this, having a technical director involved in the senior discussions of church strategy, calendaring, mission, etc is a must. And many church are starting to realize this. So in order to minimize misunderstanding or confusion, many Lead Pastors are simply hiring technology executives that know how to best use technology in a mission setting. I’ve met several technical directors that have recently moved into this role. They’re typically on the executive team along with others who report directly to the Lead Pastor. Their job is to oversee all technology in the church and its implementation at all levels. From computers, to audio, to video, to lighting, to databases, to networks, to online campuses, and the interconnections of them all, their job is huge. And critical to the overall mission of the church. There is little gap between senior level decision-making and the daily mission of the church when it comes to technology. Not sure if you need this type of staffing structure? Take an inventory of technology you depend on daily. Walk around your church campus and count up how many projectors and TVs need to be active and working to make your ministry function. Not just Sunday, but other days of the week too. How many sound systems, video systems, lighting systems, how many computers does your staff have? Don’t forget online streaming, or multi-sites, wifi, the network, phone systems, alarm systems, security cameras. Now that you have a list, you may need to consider altering your staff to account for greater use of technology. This is a major change we’re seeing and we don’t think it’s going to go away. As time goes on, we’ll only become even more dependent on technology. As such, let’s make sure our churches are invested in its wise and effective use. How is your church structured in terms of tech staff? Do you have a technical director sitting at the executive level? Previous Post: « Do You Know Your Personality Type?